Great 1 bedroom, 1 bath condo opportunity that would be perfect for a student or first time buyer! Features include a carport, private storage room, and the community offers a fitness center and pool! Many updates including new flooring (2018), bathroom (2017), Furnace and AC (2016), hot water tank (2016), and newer refrigerator. Common laundry for building. Right across from Anheuser-Busch Sports Park, just a few miles from campus & downtown, and close proximity to all shopping & dining on Bethel Rd! One Dutch company specializing in real estate promotion has taken the concept of staging to a new level. In order to get some local buzz on a house — they added a roller coaster to take potential purchasers through the house. The coaster carries one person at a time, from the bottom floor, through the garage, then up the stairs to the first floor. After rolling through the kitchen and living room, riders are sent across the patio and upstairs the top floor of the house. When Selling, how will your home stand out among the others? One way…we’ve been testing new solar sign lights on a few our listings to illuminate our signs at night and get our clients homes noticed and we are pleased with the results, you’ll be seeing more of our signs illuminated over the next week. This is just one of many ways we are leading the way to selling homes in the Columbus market. http://www.grt-group.com/wp-content/uploads/2017/10/new-grt-logo.png 0 0 William Robbins http://www.grt-group.com/wp-content/uploads/2017/10/new-grt-logo.png William Robbins2012-07-29 06:40:142012-07-29 06:40:14WHEN SELLING, HOW WILL YOUR HOME STAND OUT? PICTURE YOUR HOME ADDED TO OUR LIST OF SOLD HOMES! PICTURE YOUR HOME ADDED TO OUR LIST OF SOLD HOMES! The Real Estate Experience Redefined. Selling the neighborhoods of the Columbus Metro Area and beyond, the Gledhill Robbins & Talis Group measures our success not in the quantity of clients, but in the quality of our service and client satisfaction. We embrace a hands on agent/client relationship and utilize today’s technology and marketing techniques to enhance your buying and selling experience. http://www.grt-group.com/wp-content/uploads/2017/10/new-grt-logo.png 0 0 William Robbins http://www.grt-group.com/wp-content/uploads/2017/10/new-grt-logo.png William Robbins2011-11-02 16:12:302011-11-02 16:12:30PICTURE YOUR HOME ADDED TO OUR LIST OF SOLD HOMES! 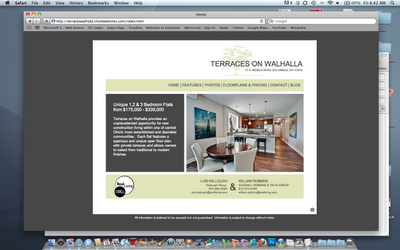 Over the last week, we’ve been working on creating a new website for Terraces on Walhalla. Above and below are some of the screen captures from the site.